The Digital Library Federation (DLF) 2016 Forum was held alongside the DLF Liberal Arts Colleges Pre-Conference and Digital Preservation 2016 this year from November 6-10 at the Pfister Hotel in Milwaukee, Wisconsin. Self-described as a ”meeting place, marketplace, and congress“ of digital librarians from member institutions and the wider community, the conference, under the leadership of Bethany Nowviskie, set a welcome precedent of accessibility and inclusivity this year. As registration began, DLF released a major revision to their Code of Conduct, expanding the statement to include appropriate models of behavior for the event (such as giving the floor to under-represented viewpoints) and detailing what behaviors may qualify as harassment (such as “sustained disruption of talks or other events”). Other efforts included publishing a guide to creating accessible presentations, encouraging DLF community members to vote on the program, offering the option to list a preferred gender pronoun on conference name tags and sponsoring an Ally Skills Workshop that taught “simple, everyday ways to support women in their workplaces and communities” that took place on November 8th. This ethical intentionality set the tone of the forum, whose keynotes and panels resonated around a central theme of professional self-critique and care. What are our responsibilities as digital librarians? What can we do better? How do our actions reflect who we care for and who we don’t? 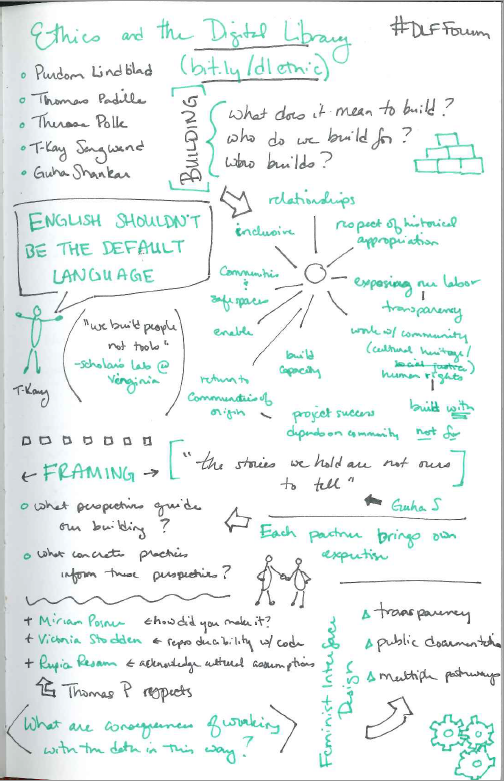 “Ethics and the Digital Library” session sketchnotes by Kristen Briney on figshare. Jarret M. Drake, Digital Archivist at Princeton University’s Seeley G. Mudd Manuscript Library, opened the DLF Liberal Arts Colleges Pre-Conference with his keynote “Documenting Dissent in the Contemporary College Archive: Finding our Function within the Liberal Arts,” in which he argued that college archives should document student protests and activist efforts that are critical of the campus in an effort to stop re-occurring injustices. Stacie Williams, the Learning Lab Manager at the University of Kentucky’s Special Collections Research Center, gave the DLF Forum keynote titled “All Labor is Local.” Speaking from her experience as a mother of two, Williams highlighted the necessity of care work in making all other types of labor possible. She called for all librarians to evaluate their organizations, tools and systems with a caregiver’s approach- do they meet basic needs, sustain societal functionality and/or alleviate pain? Williams urged libraries to prioritize our impact on local communities, stop unpaid and underpaid digitization labor and exploiting student labor in general. She highlighted Mukurtu, an open-source content management system that empowers indigenous communities to manage their digital heritage on their own terms, as an example of a care-based project that embodied these ideals. Bergis Jules, the University and Political Papers Archivist at the University of California, Riverside library, opened Digital Preservation 2016 with his keynote “Confronting Our Failure of Care Around the Legacies of Marginalized People in Archives,” in which he pointed to a library profession, its archives and funding agencies dominated by white perspectives that have failed to care for the legacies of marginalized groups and who share responsibility for the eradication and/or distortion of these groups. He praised community archive projects such as the Digital Transgender Archive, A People’s Archive of Police Violence in Cleveland, and The South Asian American Digital Archive as models we should look to as we evaluate how our own collections represent or silence marginalized groups. National Digital Initiatives is interested in approaches to computational use of library collections, and we were pleased to see a large representation of digital scholarship themed panels at the forum. Much like the Collections as Data symposium we hosted earlier this year, practitioners focused on people over tools in their presentations. At #t2d: Managing Scope and Scale: Applying the Incubator Model to Digital Scholarship panel, librarians from UCLA, University of Nebraska-Lincoln, University of Michigan and Florida State described their efforts to build digital scholarship communities on campus and facilitate research projects. Programs such as Florida State University’s Project Enhancement Network and Incubator (PEN & Inc.) and UCLA’s Digital Research Start-Up Partnerships for Graduate Students (DREsSUP) programs enroll faculty, librarians and graduate students in collaborative projects that encourage mutual skill-building and perpetuated mentorship. Representatives from the University of Nebraska-Lincoln, who have graduated three cohorts from their Digital Scholarship Incubator program to date, also discussed the shared challenge of balancing the need for iterative, responsive support for fellows with a set curriculum. Paige Morgan, Digital Humanities Librarian at the University of Miami, and Helene Williams, Senior Lecturer at the University of Washington Information School, presented the results of their quantitative investigation of the role of digital humanities (DH) & digital scholarship (DS) during the #t5b: DH panel. Studying job ads from 2009 to 2016, they found skills for these types of positions have changed and expanded significantly over time, from an emphasis on digitization and databases (2010) to data management, analysis, project management and understanding the scholarly communication process (2016). Skills associated with copyright and rights management consistently increased over the period. 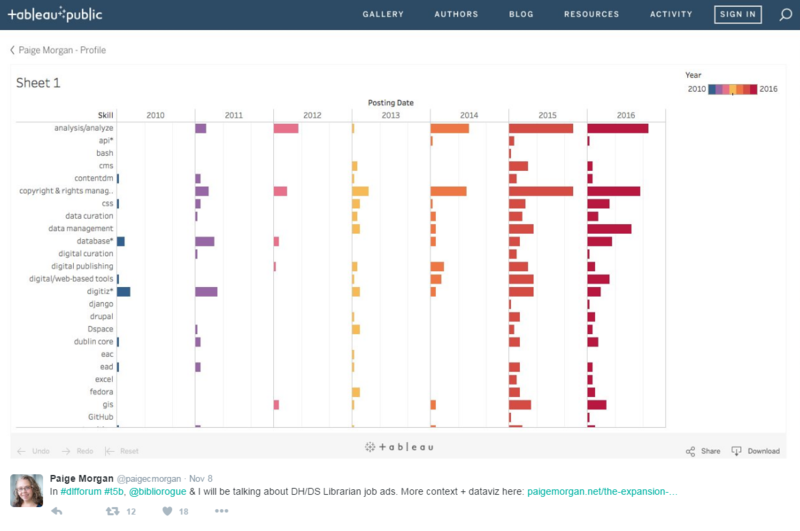 Morgan’s tweet featuring the tableau visualization of DH/DS competencies by Morgan and Williams. For the full worksheet, click here. Later in this session, Matt Burton and Aaron Brenner from the University of Pittsburgh used adult learning theory to ground their talk “Avoiding techno-service-solutionism. Organizations who want to cultivate DH culture among staff, they argued, should shift their thinking towards one of mutual inquiry and a provision of differences, moving from a bounded set, or “in” and “out”, model of thinking to a centered set that assumes everyone is on a vector heading towards a DH future. See their slide deck and accompanying references here. 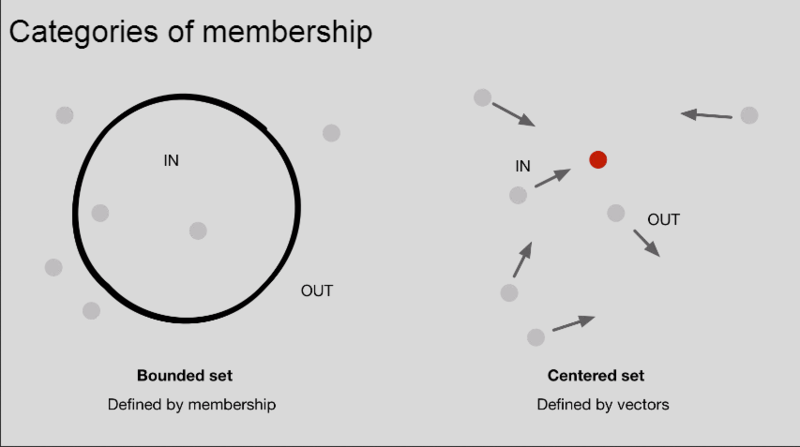 This visualization of membership models struck me as representative of the forum as a whole. Many attendees at DLF pushed back against a static, inherently exclusive definition of librarianship, illustrating instead either literally or by example a dynamic definition that recognizes we are all on the same vector and must use our work to facilitate meaning-making and care with each other and our communities. To see NDI’s presentation at Digital Preservation 2016, see this Signal post. The next DLF forum will be held from October 23-25 in Pittsburgh, Pennsylvania. This is a syndicated post. Read the original at The Signal 2016-11-23.